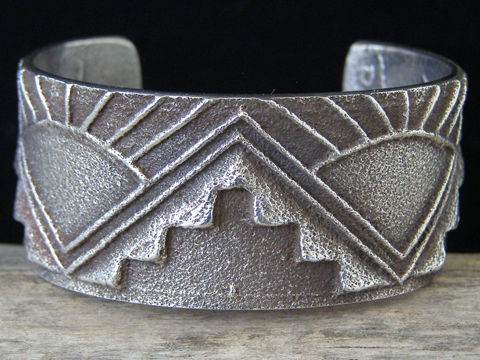 Gilbert "Dino" Garcia Tufa Cast Sunrise & Kiva Steps Bracelet size 5 1/2"
This one-inch wide bracelet shows an intricate, hand-carved pattern of a series of rising suns and mountain peaks, as well as carved motifs cast on the inside of the bracelet. Dino calls this his Sunrise and Kiva Steps bracelet. A photo above shows an example of the type of hand-carved mold used to cast such pieces. After carving his mold and prior to pouring molten Sterling into it, Dino blackens the inside of the mold by using his acetylene torch. Normally, an acetylene torch is used with a combination flow of acetylene and oxygen. The oxygen makes the flame burn hotter, but also aids in burning off the carbon. Dino lights his torch with only the acetylene flow turned on and, in the absence of oxyen to burn off the carbon, the inside of the mold is blackened. Then he pours his molten silver into the mold and the carbon fuses with the silver surface and creates a nice contrast in the deep-carved parts of the mold. After cleaning up the cast bracelet and buffing it, the raised motifs are shiny and the nooks and crannies are blackened. Note on sizing: These bracelets, though sturdy, are relatively malleable and can be easily adjusted for size. But do be certain that if you must adjust the size, you will still have adequate gap to slip it on easily and a small enough gap that the bracelet won't be trying to slip off your wrist. In short, normal relationships of "terminal to terminal" measurement to "gap size" still apply, but a one-eighth inch adjustment to size is easy to achieve. Dino's hallmark appears as the cast word Dino on the inside of the bracelet.